BT to broadcast Premier League matches with Dolby Atmos sound | What Hi-Fi? The company is upgrading its YouView service with a new design, more 4K content with Dolby Atmos sound, and an on-the-go app. BT has announced its 'next-generation' TV service, which includes a redesigned user interface and Dolby Atmos sound for BT Sport Ultra HD customers, which we reported in November. Dolby Atmos is a surround sound technology that focuses on placing sound above as well as all around you, either through additional speakers built into the ceiling or by using extra upward-firing speakers in addition to a conventional surround package. BT is planning to broadcast the first game of the Premier League - and every League game thereafter - live in 4K and Dolby Atmos from the 31st January 2017. The company is also doubling the number of sports events broadcast in Ultra HD in 2017, and is looking to expand to provide Dolby Atmos films. The latter will probably be released in collaboration with AMC, which is available exclusively on the BT service. BT is also bringing out a new design for its YouView platform, which will be automatically downloaded to all BT products. This update adds a separate section for purchased or recorded content, and will automatically play the next episode of a series - similar to Netflix or Amazon Prime Instant Video's services. 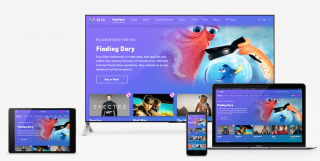 It has also added dynamically managed interfaces based on usage data or editorial decisions, so the BT YouView platform will now suggest content for you to watch based on your past viewing history, or promotions from BT. In summer 2017 the company is bringing out a new BT TV app, so that customers can watch content they have downloaded on their smartphones and tablets. This comes shortly after Netflix announced a similar update to its iOS and Android apps. Due to BT's purchase of EE last year it's also likely that the EE TV service will be closing sometime in the future - the company says that it is in the "process of evaluating EE TV" but that it "doesn't make sense" to have two competing video content platforms. Following the predicted updates to Sky Q, and the recent announcement of a new TV box by Virgin, it appears that the leading subscription TV companies are heading into the New Year with mobile apps and UI customisation at the forefront of their services.